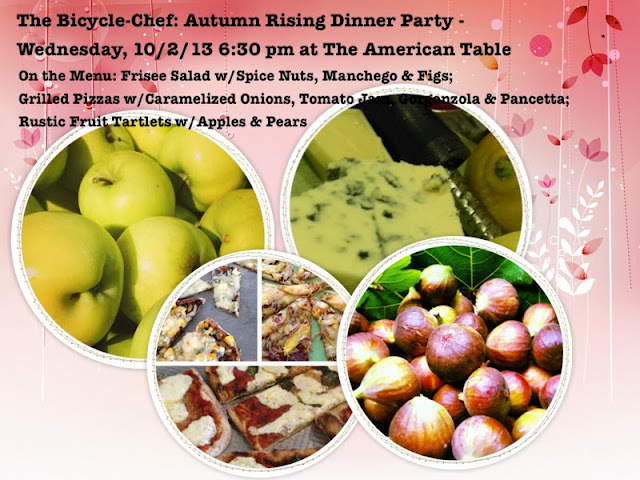 I have a cooking class coming up on Wednesday, October 2nd - at The American Table, 6:30 pm in Collingswood, NJ. The class will feature the best of the late Summer, Early Autumn Season - Figs, Apples, Pears, Cheeses, Nuts, Grilled Pizzas (which can be made indoors or out) and Rustic Fruit Tartlets. Class size is up to 11 people, $35 per person, byob (wines strongly encouraged!) The classes are fun and informative, filled with a generous tasting menu, the recipes and many cooking tips that you will use as soon as you get back to your own kitchen. Join me at the table at The American Table - 704 A Haddon Avenue, Collingswood New Jersey 08108 to register for the class, check out the link to the registration page here. Hope to see you at the class!